How excited was I? 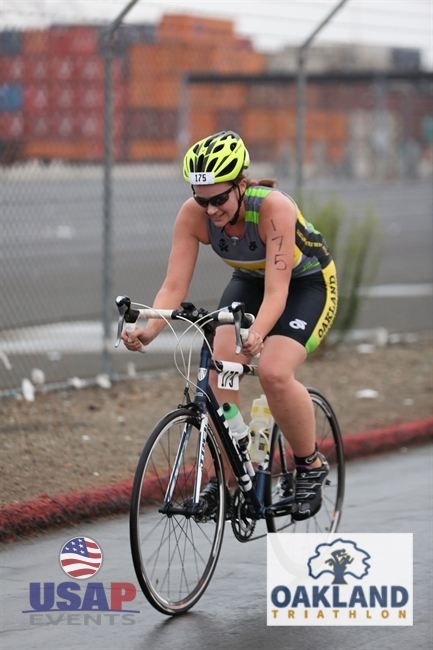 8 months ago, this was going to be my first triathlon ever. I’m so glad I signed up for some others before. I felt really confident about the bike. I was a little unsure of how I’d fare in the swim – at first, I was overconfident. Then I realized we were swimming with men, and I was a little nervous (rightfully so). Then I got in and just dealt with it. T1 and the run were always on the back of my mind – am I going to trip? Am I going to puke? How will I handle the stairs?! I figured, hey, let it happen, just race your race. I’m glad I did. Living in the city of your race is a luxury; living a 10 minute bike ride from your race is just ridiculous. The race itself was initially scheduled for a Sunday, but due to a Raiders preseason game, it was rescheduled to a Saturday in order to ensure we would have enough law enforcement on the course. 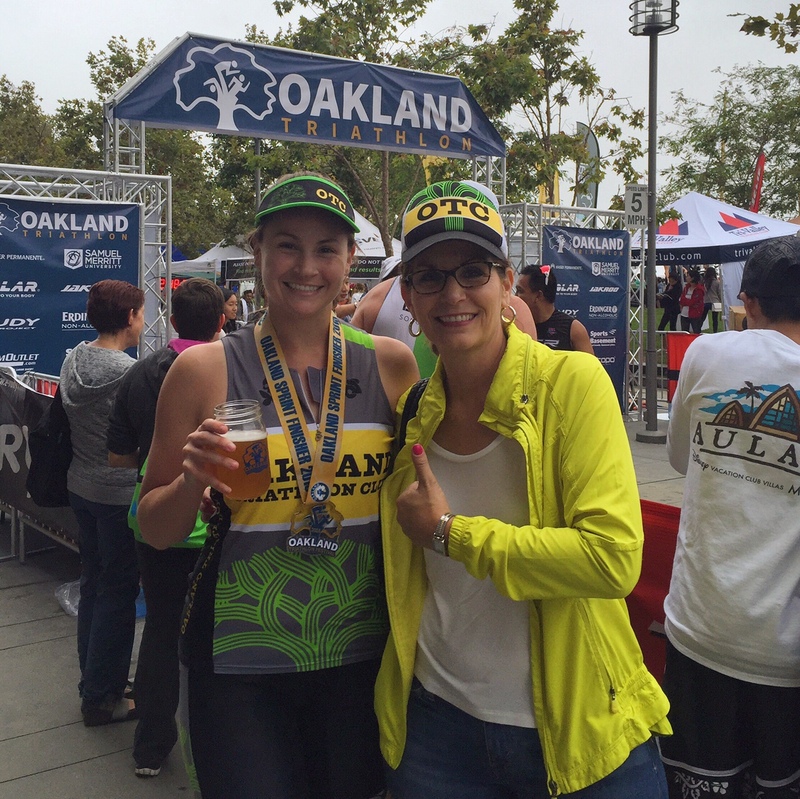 My employer was generous enough to allow me to take a day off on the Friday before, so I attended the Oakland Triathlon Festival Expo, picked up my packet, and hung around the finish line for a bit. Probably not the smartest move on my part, because it was in the high 80s and very humid. I did realize that one of my teammates is my neighbor, so I had a buddy to ride down with the next morning! 4:40 am is a good a time as any for an I’m-thrilled-to-be-awake selfie. Thankfully my teammate and I are similar in that we prefer to be on the early side. After cruising down a nearly empty Broadway (yet, still crowded enough to almost get hit by an AC Transit bus?? ), we arrived at Transition at 4:50 am – it didn’t open until 5:00 am – but we got our spots on the rack and set up. I’m not sure how parking worked, but my mom drove in and parked in Jack London Square without too much issue – if she can do it without problems, I’m sure it was pretty easy! There was an option to drop shoes at the swim exit for T1. I opted out, but combining that with the walk to the swim start was a pretty long distance. I didn’t hear about people missing their start, but wow that was a long way to go! 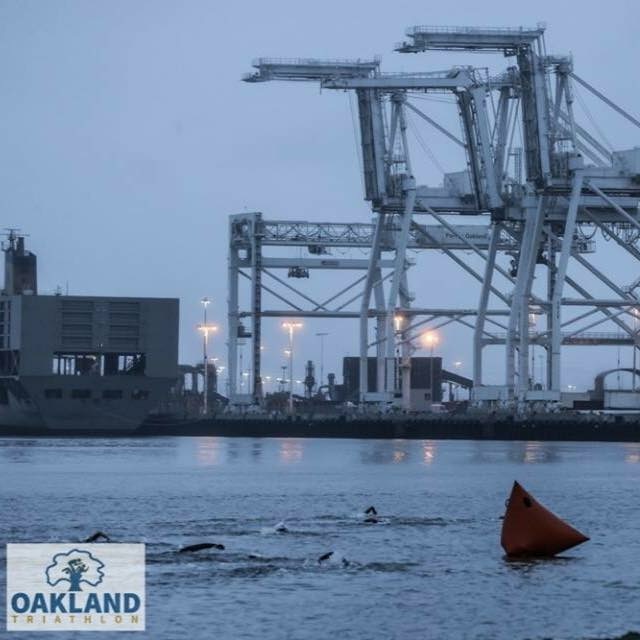 The swim took place in the Oakland Estuary (yes, where a dead whale surfaced a few days prior… RIP). With modifications from last year’s course and a significantly different current, the swim times were drastically different from the year before. I was expecting a swim in the range of 8:30 to 9:30 – as you can see above, that isn’t what happened. My teammates’ Garmins suggested that the swim was longer than 0.6 miles (960 yards) and in fact much closer to 1100 or 1200 yards. With some pace analysis, I am much more inclined to believe that the course was in fact a longer distance than reported. My sighting was a little funky, but my race pace is far closer to 1:25/100 m (my pace at 1150 m) than 1:39/100m (which is really, REALLY slow for me). As for an actual report: I will be very happy if I don’t have to start with men or children ever again. I was in Wave 1 (yay!) with everyone under 30 (men and women) and over 55 (men and women). This was a huge wave. The start line was extremely crowded, and with a deep water start, there was no rhyme or reason to where people were lining up. I knew I needed to be near the front to maintain my sanity (and also because I belonged there!) but there were plenty of teenage boys and girls who looked very uncomfortable all around me. The start was difficult to hear. At first I was unsure they were ready because there were no life safety volunteers in the water, but I heard a countdown and I heard “Go” so I went! I started out, found my line, and got into a rhythm. Some guy decided he liked my position – I was there first! – and decided to swim within 8 inches of me for two-thirds of the swim. He had a strange right arm recovery, and hit the back of my head every few strokes. After pinballing our way down the course, he must have made an angle right at me because on one of my left arm strokes, he swam right onto my elbow. I felt bad for hitting him, but it wasn’t intentional! He immediately dropped off so I guess we learned who was more stubborn. As for the person who grabbed my calf, I don’t feel bad for kicking them. Sure, it’s open water, and you can grab people. But come on – this person didn’t accidently hit my leg and grab, this was an intentional, thumb-on-top calf grab. I’m competitive, but I know when to make my move. If you’re faster than me, I’ll let you go. But you try to hold me back? I’ll kick you in the face. Race organizers instructed us to “belly flop” onto the low inflatable docks to get out of the water. That was a fantastic strategy. I was up in seconds without relying on the volunteers, and off to T1. Official photo, which USAP provided for free! Notice Oakland’s natives, the waterfront AT-ATs. Before the race, I thought T1 would go on forever. I was pretty close to right. The run from the exit went past the finish line (wait, no! I want to stop there! ), down the street for a few blocks, and then up and over the Amtrak Bridge. That’s it, right? Nope. Up another block, and then you get into Transition. My transition was actually really solid. Wetsuit was off in seconds, helmet was on, shoes were on, and I was out of there. This bike leg may end up haunting my nightmares. 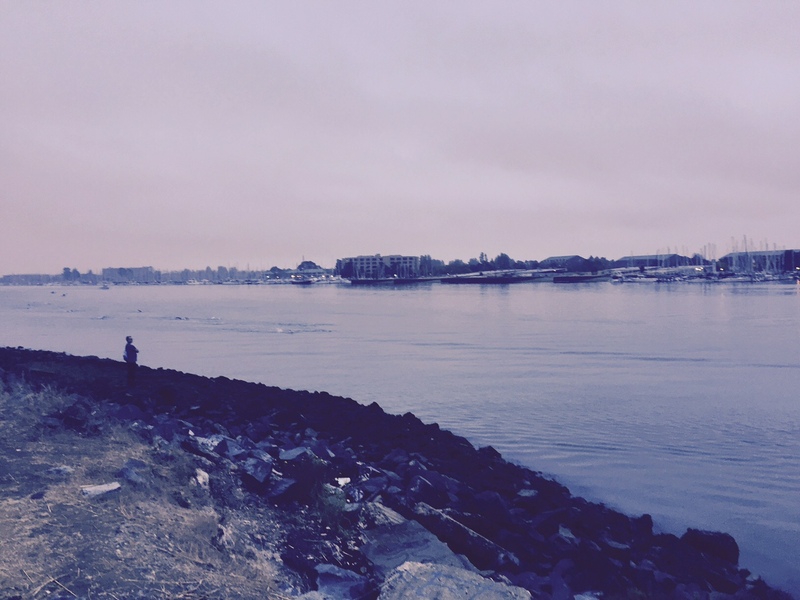 The race organizers had nothing to do with the weather – that’s not my complaint. I understand there’s a need to follow less-crowded streets and avoid construction, hence all the turns – that’s also not my complaint. My biggest annoyance is that the exit from transition is essentially one big U-Turn. The mount line was immediately outside of transition, where you had to make a left on Jackson, and immediately another left onto Fourth. One man in front of me did a beautiful flying mount only to have to stop because he couldn’t make the turn. The one woman in front of me was smart and ran through the first turn, and she was off like a light. The course itself is on urban roads – see my course preview. There are potholes! There are lumps and bumps! I dealt with it. OTC dealt with it – we only had one crash on the team. The rest of the racers were so full of complaints… I can only imagine what the organizers dealt with. Things to work on: actual triathlon skill and finding photographers. What was truly impressive was the volume and quality of OPD and Highway Patrol and course volunteers. They were everywhere! I had only one car cross the road at an awkward time and surprisingly that was on the way back to transition. Kudos to everyone who worked / volunteered on Saturday. You guys were awesome on the bike course. I tried to say thank you to everyone, but to the few that I missed – thank you. My back wheel only skidded one time, and I felt great for the entirety of the course. If only Broadway had no lights and no cars all the time! There were a few volunteers right before T2 from OTC and they were awesome! I don’t know how but they recognized me, and cheered as I passed them. I needed this boost! 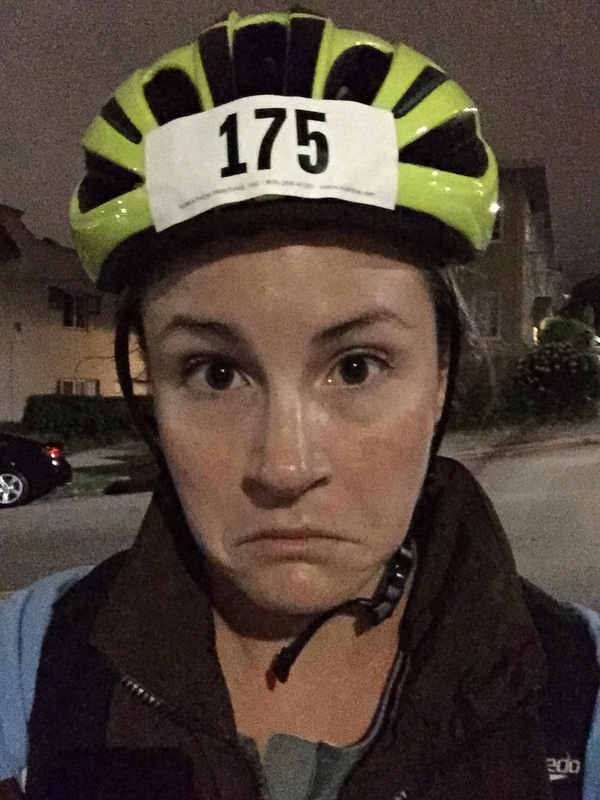 As I ran into transition, I counted the racks and looked – where was my stuff? Oh no! And then almost immediately after I realized I was on the wrong side and had to make it past the half way mark and then count the racks. Duh. As folks in wetsuits moved past me I thought to myself, wow I can’t believe I beat some swimmers back! The relay that set up next to me jumped out of my way (after a quick, unintelligible garble). Transition was otherwise uneventful. You know that running is the bane of my existence, right? 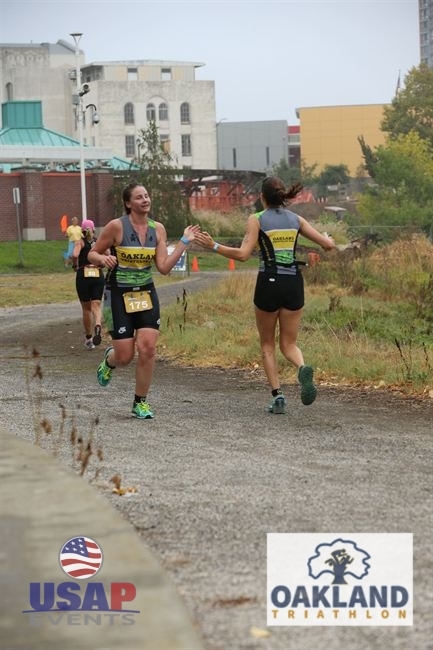 I ran out of transition and my mom was right there, cheering me on. I could tell she was stoked, but little did we know that I was about to crash and burn. I made the right onto Jackson and as I started down Second, a car decided to start pulling out right into me – where were the volunteers?! I screamed “HEY!” at them, with my hand up in a stop motion, and continued on my way. I made it about half a mile, and then the cramps started. First lightly in my left calf, and then a side stitch. It was a long 2.5 miles to the finish line, but I fought and pushed and walked a little and eventually made it there – admittedly faster than I expected. The OTC folks on the run were so awesome – a few passed me (good! Go faster than me, if you don’t I’ll be mad), I shared some high fives, and finally made it back to the Amtrak station. Right before the bridge, I happened to look down and see a pile of something… gross. Definitely human, definitely not vomit. However, my vomit almost joined it on the sidewalk (spoiler, it didn’t). Aw, look who it is!! Take note and do not run like me. Dying a little inside. I was shocked to hear the volunteers at the bridge, “Watch for athletes coming down!” At first, I was bummed. Did that many people really beat me to the finish? And then I realized they meant swimmers were still coming down. I was a minute or two away from the finish, and these people hadn’t even stripped off their wetsuits – for as bad as my run was, I could be them! Crossed the bridge – started running again at the top – and quickly headed down the very wet steps. No falls! The woman volunteering at the entrance to the steps was the same one as the morning, so she had been there for a long time. I smiled, tried to say something (I don’t think anything came out), and ran through the last tenth of a mile. I crossed the finish line and was welcomed immediately by the OTC members that passed me, my mom, and our club president. Pfew! Finished. Guess I got hot? I forgot I unzipped my top. OTC made a point of sticking around for our last club finisher, and a whole crew of us stayed for the very last race finisher. I can’t know what was going through the heads of the last few folks on the course, but they sure looked thrilled when they crossed the line. I hope we made a good impact on their race day! 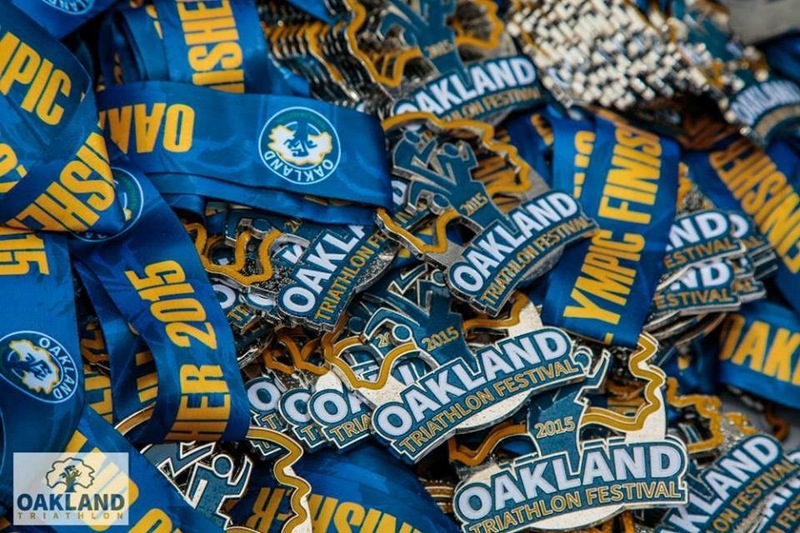 I am so proud to be a member of Oakland Triathlon Club. What a fantastic, inspiring, and genuine group of people. Love you guys! 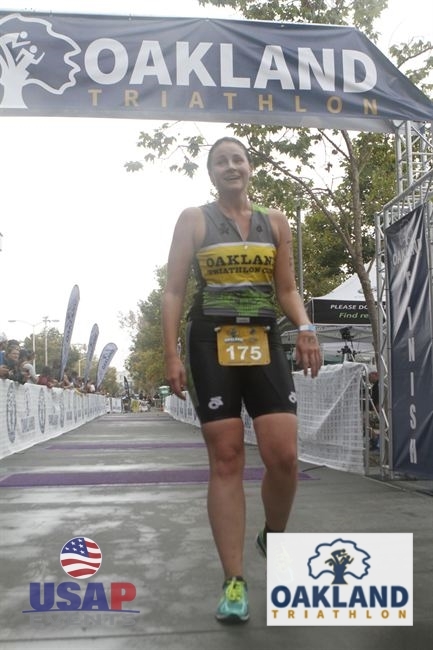 Make sure to check out their race reports, especially Rachel – she is crazy knowledgable, and (even though she’ll yell at me for my use of ‘literally’) I literally have learned at least 2/3 of all that I know about triathlon from her. My number 1 (and only) fan! Thanks Mom, love you. I’m still hungry. I had a good race (can’t complain too much about first in your age group), but I am still kind of let down. I wanted to run better, and I wanted to swim better. I know I have more in me, and I know I have more to train. This has been a fantastic first race season and I can’t wait for many more! Sweet bling. Ok, I didn’t bring this one home because I did the sprint, but you get the idea. USA Productions did a great job in their second year in Oakland. I believe they’re putting on a new race next year (location to be determined), but I’ll definitely be trying to catch more of their races in the future. Special thanks to Race Director Ryan for answering my questions! 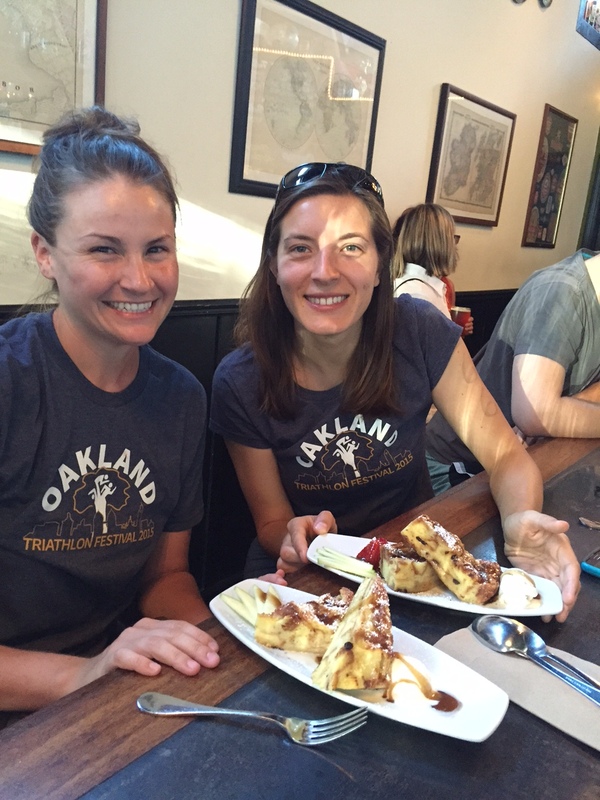 Probably the best part of the day – beer and bread pudding with KP. 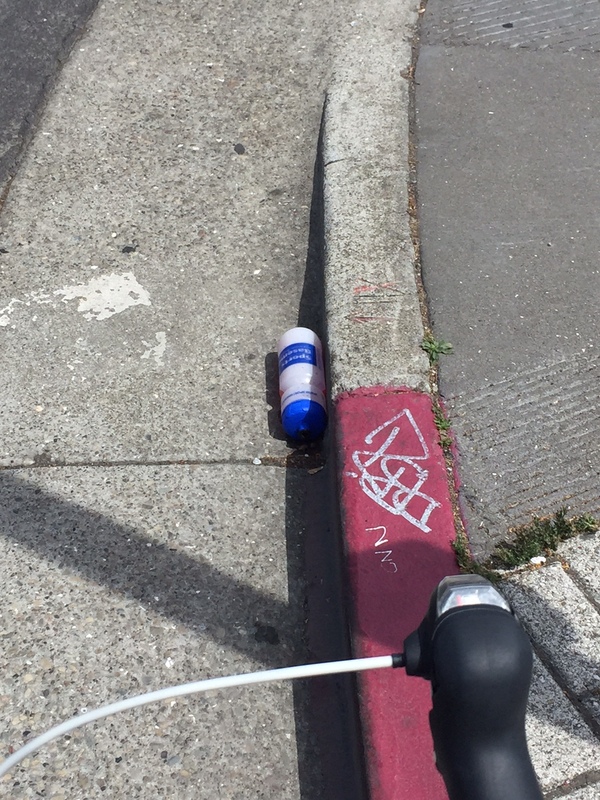 And as one last aside – in case there were any doubts about the bumps on the bike course, I almost (almost, but didn’t) bring home one last souvenir I found on Broadway on my way home: a bounced OTF water bottle. If you’re having hydration problems I feel bad for you, son. I got 99 problems but a loose screw on my bottle cage ain’t one. New album dropping 2016 (just kidding). Sweet report yo! You get a pass on using “literally” because of your timely adoption of speed laces.